4. Is the state of ‘being still’ a state involving effort or effortless? It is not an effortless state of indolence. All mundane activities which are ordinarily called effort are performed with the aid of a portion of the mind and with frequent breaks. 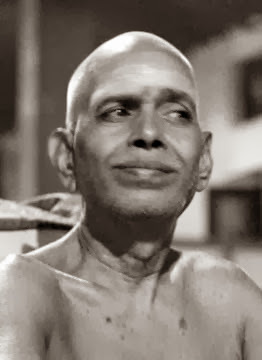 But the act of communion with the Self (atma vyavahara) or remaining still inwardly is perfect effort, which is performed with the entire mind and without break. Maya (delusion or ignorance) which cannot be destroyed by any other act is completely destroyed by this perfect effort, which is called ‘silence’ (mouna). 5. What is the nature of maya? Maya is that which makes us regard as non-existent the Self, the Reality, which is always and everywhere present, all-pervasive and self-luminous, and as existent the individual soul (jiva), the world (jagat), and God (para) which have been conclusively proved to be non-existent at all times and places. 6. As the Self shines fully of its own accord why is it not generally recognized like the other objects of the world by all persons? Wherever particular objects are known it is the Self which has known itself in the form of those objects. For what is known as knowledge or awareness is only the potency of the Self (atma sakti). The Self is the only sentient object. There is nothing apart from the Self. If there are such objects they are all insentient and therefore cannot either know themselves or mutually know one another. It is because the Self does not know its true nature in this manner that it seems to be immersed and struggling in the ocean of birth (and death) in the form of the individual soul.